To Cite: Vrouva S, Batistaki C, Paraskevaidou E, Chanopoulos K, Kostopoulos D, et al. 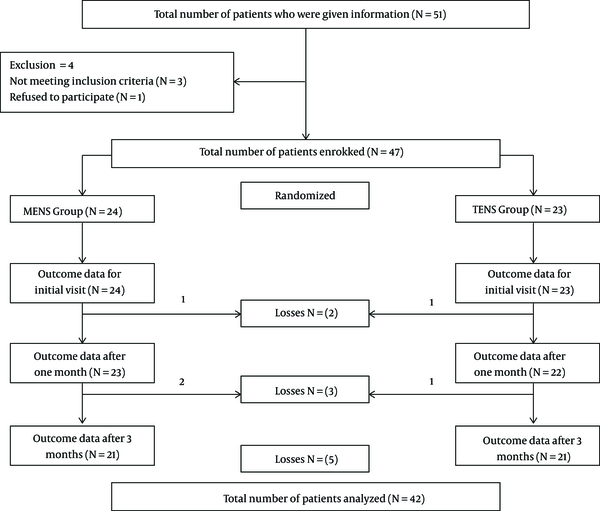 Comparative Study of Pain Relief in Two Non-Pharmacological Treatments in Patients with Partial Rotator Cuff Tears: A Randomized Trial, Anesth Pain Med. Online ahead of Print ; In Press(In Press):e88327. doi: 10.5812/aapm.88327. Background: Pain induction is the primary characteristic of a rotator cuff tear while muscle weakness appears as a secondary feature, leading to further disability. Objectives: The study aimed to determine the effectiveness of physiotherapeutic interventions through transcutaneous electrical nerve stimulation (TENS) or microcurrent electrical nerve stimulation (MENS) in conjunction with kinesiotherapy in patients with partial thickness rotator cuff tear. Methods: This was a blinded randomized prospective study. The study recruited 42 outpatients with partial rotator cuff tear under conservative treatment selected from the 401 General Military Hospital of Athens and the University General Hospital ‘Attikon’ during 2015 - 2017. Patients were assessed for pain and disability using the SPADI (shoulder pain and disability index), a numerical rating scale (NRS) for pain, and the EuroQoL-5 questionnaire for the evaluation of the quality of life. The first group received TENS and kinesiotherapy while the second group received MENS and kinesiotherapy. Three measurements were recorded. The first assessment was performed during the initial patient visit; the second after completion of the physiotherapeutic sessions, and the third one three months after the initial assessment. A follow-up ultrasound scan was performed three months after the completion of the therapeutic sessions to assess the anatomical healing of the rotator cuff tear. Results: Repeated measurements analysis indicated a significant improvement in pain scores, functionality, and patients’ quality of life (P value < 0.001). Comparison of the two treatment methods did not reveal any significant differences (P value > 0.05) despite the fact that the MENS was associated with a greater improvement in pain intensity and TENS with a greater improvement in functionality and quality of life. Conclusions: Using MENS and TENS appears to be equally effective in terms of pain relief, functional improvement, and quality of life enhancement in patients. Non-pharmacological treatments such as transcutaneous electrical nerve stimulation (TENS) and microcurrent electrical nerve stimulation (MENS) have been used to treat and manage muscle pain and dysfunction. TENS has appeared in many surveys compared to laser, ultrasound, hot pack, etc. while MENS is a new electrotherapy method that its efficacy has not been validated compared to TENS in patients with rotator cuff tears. The rotator cuff (RC) assists in shoulder joint mobility and dynamic stabilization (1). The primary characteristic of a rotator cuff tear is pain induction while muscle weakness appears as a secondary feature (2, 3), leading to further reduction in mobility and functionality of the shoulder and arm (2, 3). Conservative treatment often works (2, 4) but in cases where the tear has expanded and functional problems are intense, a surgical procedure may be required (2, 4). Physiotherapy is normally the ﬁrst line of management for shoulder pain (3). It involves a wide range of interventions and is highly recommended (5). Specifically, it helps reduce the pain and muscle spasm, maintain the tract in the joint, and prevent or eliminate functional difficulties (6). Physiotherapeutic interventions include the use of kinesiotherapy, electrotherapy (such as TENS and MENS), ultrasound, pulsed electromagnetic field therapy, and shock waves (3, 6). This is while, specifically in the rotator cuff, it is preferred to use transcutaneous electrical nerve stimulation (TENS) and kinesiotherapy (7). Both TENS and MENS have been used to treat and manage pain and dysfunction. While ΤENS, in accordance with the theory of Gate control, acts inhibitory on the pain-carrying Ab fibers, MENS action seems to be related to the maintenance of homeostasis of intracellular Ca++ of damaging tissues so as not to stimulate the afferent nerves fibers. The aim of this study was to determine the effectiveness of physiotherapeutic interventions using TENS and MENS combined with kinesiotherapy in patients with partial-thickness rotator cuff tear. This is a double-blind randomized trial. The sample consisted of patients suffering from shoulder pain because of partial-thickness rotator cuff tear, confirmed with MRI and ultrasound scanning. Patients taking part in the study had not received any recent pharmacotherapy with non-steroidal anti-inflammatory drugs “NSAIDs” during the last month, nor had they had surgery in the shoulder area at any time, while the referral orthopedic had suggested physiotherapy. The total number of patients who were given information was 51 from whom; four patients were excluded (three for not meeting the eligibility criteria and one for refusing to participate). We used equal randomization such as 1:1 for the two groups based on the order of entry to the study. The allocation was made by an independent research assistant. Therapeutic interventions were implemented by the same physiotherapist. All data from patients’ examinations were recorded by an independent physiotherapist who was blinded to the study. From among 47 patients enrolled, we had five drop-outs, three from the MENS group and two from the TENS group. Finally, the data of 42 patients were analyzed (Figure 1). The patients were recruited from the 401 General Military Hospital of Athens (Department of Physical Therapy) and the University General Hospital ‘Attikon’ (Pain Unit of the second Department of Anesthesiology) during 2015 - 2017. All patients provided written informed consent for the study. The study protocol received approval from the bioethics committees of both hospitals and followed the principles of the Declaration of Helsinki. Patients with open wounds or skin diseases in the shoulder area, pregnant women, patients with any type of neoplastic disease, patients with pacemakers or serious cardiovascular diseases including arrhythmia, and patients with collagen diseases or history of shoulder surgery were excluded from the study. Pain and disability were assessed in patients through clinical evaluations, completion of pain and disability questionnaires, and an additional ultrasound scan after the completion of the therapeutic protocol. Three measurements were taken as follows: the first assessment was performed during the initial patient visit, the second after the completion of the physiotherapeutic sessions, and the third one three months after the initial assessment. All data from patients’ examinations were recorded by an independent physiotherapist who was blinded to the study through one-to-one interviews. As a follow-up, an ultrasound scan was performed three months after the completion of the therapeutic sessions in order to assess the anatomical healing of the rotator cuff tear. The classification of the results was done according to Ellman (8). • The SPADI questionnaire: it is a self-administered tool aiming at assessing shoulder ache and disability (9, 10). It has 13 items focusing on two particular areas; five items evaluate pain and the remaining eight items estimate patients’ injury (9, 10). • The numerical rating scale (NRS) for pain: with up to 10 points (10), it assesses the intensity of pain at all time-points. • The EuroQoL (EQ-5D) questionnaire: it was used to collect data relevant to the patients’ health conditions (11). This questionnaire consists of two parts: the first one examines movement, self-care, ordinary activities, ache/irritation, and stress/unhappiness (11) whilst the second part is based on a visual analog scale from zero to 100 on which patients determine their own perception of their current health condition. The scale starts from zero representing the worst health status and ends to 100 denoting a perfect health status (11). All questionnaires were translated and validated in the Greek language (9, 11). Patients were divided into two equal groups using randomization via an electronic database. The first group received TENS and kinesiotherapy while the second group received MENS and kinesiotherapy. TENS was applied in 15 sessions (five per week) for each patient by placing four electrodes on either side of the deltoid muscle on the front and back surfaces of the shoulder joint (12) for 20 min (13). A constant current of high frequency (100 Hz) was used with an intensity initiated at 10 mA that was gradually increased to 15 mA (1). MENS was applied by placing six electrodes (size 4 × 4 cm), of which four were placed exactly like the TENS electrodes; of the other two electrodes, one was placed in the palm and the other at the height of the asteroid ganglion. The duration of the intervention was 24 min for a total of 15 sessions. The frequency was 50 Hz and the intensity was 100 μA. We used four electrodes in TENS placed according to the existing literature while in MENS, since there were no standard bibliographic references; we followed the instructions of the electrotherapy company for this particular condition. Both methods were applicated for so long in order for a minimum therapeutic effect to emerge Kinesiotherapy sessions were performed by the same physiotherapist in both groups. It included initial stretching exercises for shoulder muscles and the joint (particularly for teres minor and anterior deltoid), followed by training of empowerment exercises for rotator muscles (14), stabilization and synchronicity of the scapula (14), and instructions for the continuation of the exercises at home (15) such as 15 repetitions twice per day. A priori power analysis was performed aiming to estimate the sample of patients required for establishing a statistically significant difference (16). The parameters applied included: (A) an alpha level of 0.05 for the appropriate statistical test for repeated measurements analysis for all scales (17, 18); (B) a statistical power of > 80%; (C) the effect size determined as small (f = 0.2) for the evaluation of the repeated measurements due to the short duration between the measurements, and moderate (f = 0.4) for the evaluation of differences between the two electrotherapy methods in order to reduce the probability of differences due to a chance (19). For the calculation of the required number of participants, we used GPower 3.0.10 software run based on the above-mentioned parameters. The calculations showed that by using 42 patients in total, we could be assured of an 80% power for all the assessments performed. Statistical analysis and the appropriate parametric tests were carried out using software IBM SPSS Statistics V. 20 for Windows (SPSS Inc. Chicago, IL, USA). The independent student t-test and Mann Whitney-U test were used to compare the two groups before starting the treatment. We examined the effect of the therapeutic intervention using both methods of electrotherapy (MENS and TENS) on pain intensity (NRS Now, NRS last week, SPADI pain), disability (SPADI disability), and quality of life (EQ-5D: Health today) with repeated measurements analysis of variance (ANOVA) between the primary assessment (baseline), after physiotherapy sessions (four weeks later), and after the completion of the therapeutic intervention (three months after the initial assessment). In addition, multiple pairwise comparison tests were performed to determine if there is a statistically significant difference between time points in terms of pain, disability, and EQ-5D scores. To examine the differences between the two methods of electrotherapy, F-between-subjects tests were carried out for all the mentioned variables. Data are presented as means and standard deviation (SD). The statistical significance was set at P < 0.05. A total number of 42 patients took part in the study. There was no significant difference in demographic characteristics between the two groups (P > 0.05). The patients’ characteristics are presented in Table 1. The results of independent t-test and Mann Whitney test revealed no significant difference between the groups in terms of pain, disability, and quality of life (P > 0.05) at baseline (Figure 2). The repeated measurements ANOVA for total patients and for both therapeutic modalities showed statistically significant differences between the mean values of all variables examined (P < 0.05). Specifically, a statistically significant reduction was revealed in pain intensity (NRS now, NRS last week, SPADI pain) and disability score (SPADI disability), with a concomitant increase in the quality of life (EQ-5: Health today), in both groups (Figures 3 and 4). The results of multiple-comparison per pairs at all time-points showed that this significant difference appears to be due to the large differences between the first and the last measurements, as well as between the post-physiotherapy measurements and the end of intervention in all scales. Table 2 shows the mean differences between time points for all scales and all patients. With regard to the depth of the ultrasonic rupture, the results of the paired-samples test showed that the difference in the depth of the decrease from the initial examination to the end of the therapeutic intervention was statistically significant for both groups (P < 0.001). The results of the between-subjects tests showed that pain, disability, and patients’ quality of life were not statistically different between the two different methods (P > 0.05). Figure 5 shows the mean total change in all the scales for the two different electrotherapy methods. It appears that in the MENS group, there was a greater improvement in pain scores (NRS Now, NRS last week, SPADI Pain) while in the TENS group, there was a greater improvement in functionality (SPADI Disability) and quality of life (EQ-5: Health today). However, these differences were not statistically significant for any variable (P > 0.05). a Based on estimated marginal means. b Adjustment for multiple comparisons: Bonferroni. c The mean difference is significant at the 0.05 level. The evaluation of the effectiveness of physiotherapy as a non-pharmacological treatment of patients with shoulder diseases with a high risk for adverse effects of NSAIDs or steroid injections (20, 21) revealed a 54% improvement, concluding that in the presence of a lesion at the RC, physiotherapy should precede a surgery (8, 21) and it offers positive results similar to surgical repair in selected cases (14). This study revealed that physiotherapeutic intervention with both types of electrotherapy had excellent results in about 95% of the patients. The two methods of study were not different in terms of efficacy. The SPADI scores decreased by 32.46 points in the MENS group and 32.53 points in the TENS group, while the decreases in the NRS now scores were 3.09 and 2.67 points, respectively. There were only two patients who experienced pain and disability score reductions of less than 15 and 10 points, respectively. These results are consistent with the minimal clinically important difference (MCID) of 1.5 points on a 10-point scale (or 15 points on a 100-point scale) for pain and 10 points on a 100-point scale for function or disability (SPADI) (2, 22). In the current study, all patients had a statistically significant reduction in pain intensity and an increase in functionality and quality of life. Rotator cuff disease has a great effect on the execution of daily life activities (15). These patients are often incapable of sleeping on the affected side and/or placing their hand behind their head (14). The most common symptom of these patients (in 99%) is a pain; therefore, in most cases, the key element of treatment (2) is to control the pain. However, symptoms once disappeared may return even after successful conservative treatment (2). Most patients with partial rupture involving rotator cuff bursal surface are not satisfied with the conservative management results (21), a fact that is in contrast to the results of our study, where the majority of patients, according to Ellman (8) classification, had a positive feeling about physiotherapy. In a similar study, gradual growth in size was found, with just a minor 18% - 49% enlargement of more than 5 mm in two years of examination (14). The results from the ultrasound scanning in our study are alike and revealed that the depth of the tear increased by about 0.209 mm after three months. Although a strong association seems to exist between symptom appearance and tear size expansion (2), we observed that despite the tear growth, patients showed significant pain relief. Edwards et al. (14) noted that 28% of patients had symptomatic tears in the non-dominant shoulder and 36% of them suffered bilateral tears. Similarly, in our sample, only 7% of the patients had a partial rupture in the non-dominant shoulder while bilateral tears were present in 28.6% of the cases. Moreover, shoulder movement was associated with age and gender in patients with symptomatic, atraumatic rotator cuff tears. The tear size and asperity were irrelevant to shoulder movement due to that the patients evolved compensative kinematics and became stronger, leading to symptom prevention or reduction (14). In previous research, age did not influence the goodness and excellence of results while the occupational factor was more significant (21). The sample of that study consisted of 16 patients (38%) aged < 45 years and 26 (62%) aged > 45 years, similarly to other studies (23, 24) in which participants aged 45-64-years-old. Moreover, 88% of the participants were working mainly with their hands (scientific staff, doctors, nurses, etc.). Electrotherapy modalities are physical therapy variations aiming at reducing painful symptoms (2). A previous study revealed that TENS arguably relieved the pain shortly after treatment compared to placebo (2). In addition, a meta-analysis by DeSantana et al. (25) investigating the effectiveness of electrical nerve stimulation for chronic musculoskeletal pain pooled the data from 32 studies on TENS (high frequency, low frequency, variable frequency, and acupuncture-point) and six on percutaneous electrical nerve stimulation, revealing a significant decrease in pain (25, 26). Similarly, MENS therapy has been used to treat and manage muscle pain and dysfunction (27). It is a new approach being able to positively influence patients through delivering monophasic or biphasic pulsed microamperage currents (27). A recent study demonstrated that patients receiving MENS as frequently as three times a week for one and a half month showed unquestionably lower overall pain and better functional status after six weeks than those receiving placebo (2). Although the findings suggest that the short-term application of MENS may play a partial role in enhancing physical activities, it can improve the function of some muscles (27, 28). To our knowledge, our study is the first to compare these two methods of electrotherapy (MENS vs. TENS) in patients with partial rotator cuff tear. Our results clearly showed improvements by both methods, with MENS leading to greater improvement in pain and TENS leading to greater improvement in functionality and quality of life although without a statistical significance. The additional use of kinesiotherapy also improved the results. Generally, exercises in the treatment of shoulder ruptures (29) can play the role of a catalyst for improving the quality of life and relieving pain, particularly in the age group of > 75 years. For this reason, kinesiotherapy sessions must be included in all conservative methods of rotator cuff rupture management. During the 15 sessions, patients were trained by an independent physiotherapist to perform daily exercises. They were provided with brochures to check what exercises they were doing and where they were having difficulties. Unfortunately, beyond the testimony of the participants, the researchers did not have a way to find out if they kept the guides. But everybody brought his/her brochure filled every week. Since the effects of electrotherapy do not last more than three months, if they did not continue the exercises, the results of the study would change if a new measurement was made six months or one year after the onset of the treatment regimen. The small sample size limited the study as it focused on patients who had only partial rotator cuff tears with no accompanying problems in their shoulder. Considering the drawbacks of surgical rehabilitation, including the long duration, absenteeism, and high costs, efforts are now underway to assess the effectiveness of conservative therapy (30). The physiotherapeutic intervention proposed in this study involving the use of two different methods of electrotherapy combined with kinesiοtherapy appears to be very effective in terms of pain relief, functional improvement, and quality of life promotion in patients with rotator cuff tear. Despite that MENS was associated with greater improvement in pain and TENS with greater improvement in functionality and quality of life, the results indicated no significant difference between the two modalities. Authors' Contribution: Sotiria Vrouva contributed to study design, study conduct, data analysis, and intellectual content revision of the manuscript; Chrysanthi Batistaki contributed to study design, study conduct, data analysis, and intellectual content revision of the manuscript; Efterpi Paraskevaidou contributed to study conduct; Konstantinos Chanopoulos contributed to study design, analysis, and intellectual content revision of the manuscript; Dimitrios Kostopoulos contributed to study conduct and intellectual content revision of the manuscript; Efthimios Stamoulis contributed to study conduct and intellectual content revision of the manuscript; Georgia Kostopanagiotou contributed to study design and intellectual content revision of the manuscript. Conflict of Interests: There are no conflict of interests regarding this study. Funding/Support: There is no funding support for this study. 1. Page MJ, Green S, Mrocki MA, Surace SJ, Deitch J, McBain B, et al. Electrotherapy modalities for rotator cuff disease. Cochrane Database Syst Rev. 2016;(6). CD012225. doi: 10.1002/14651858.CD012225. [PubMed: 27283591]. 2. Itoi E. Rotator cuff tear: Physical examination and conservative treatment. J Orthop Sci. 2013;18(2):197-204. doi: 10.1007/s00776-012-0345-2. [PubMed: 23306597]. [PubMed Central: PMC3607722]. 3. Green S, Buchbinder R, Hetrick S. Physiotherapy interventions for shoulder pain (review). Cochrane Lib. 2007;(4). 4. Ryosa A, Laimi K, Aarimaa V, Lehtimaki K, Kukkonen J, Saltychev M. Surgery or conservative treatment for rotator cuff tear: A meta-analysis. Disabil Rehabil. 2017;39(14):1357-63. doi: 10.1080/09638288.2016.1198431. [PubMed: 27385156]. 5. Varela E, Valero R, Kucukdeveci AA, Oral A, Ilieva E, Berteanu M, et al. Shoulder pain management. The role of physical and rehabilitation medicine physicians. The European perspective based on the best evidence. A paper by the UEMS-PRM Section Professional Practice Committee. Eur J Phys Rehabil Med. 2013;49(5):743-51. [PubMed: 24145232]. 6. Green S, Buchbinder R, Hetrick S. Physiotherapy interventions for shoulder pain. Cochrane Database Syst Rev. 2003;(2). CD004258. doi: 10.1002/14651858.CD004258. [PubMed: 12804509]. 7. Bialoszewski D, Zaborowski G. Usefulness of manual therapy in the rehabilitation of patients with chronic rotator cuff injuries. Preliminary report. Ortop Traumatol Rehabil. 2011;13(1):9-20. [PubMed: 21393644]. 8. Ellman H. Diagnosis and treatment of incomplete rotator cuff tears. Clin Orthop Relat Res. 1990;(254):64-74. [PubMed: 2182260]. 9. Vrouva S, Batistaki C, Koutsioumpa E, Kostopoulos D, Stamoulis E, Kostopanagiotou G. The Greek version of Shoulder pain and disability index (SPADI): Translation, cultural adaptation, and validation in patients with rotator cuff tear. J Orthop Traumatol. 2016;17(4):315-26. doi: 10.1007/s10195-016-0425-8. [PubMed: 27623841]. [PubMed Central: PMC5071243]. 10. Breckenridge JD, McAuley JH. Shoulder pain and disability index (SPADI). J Physiother. 2011;57(3):197. doi: 10.1016/S1836-9553(11)70045-5. [PubMed: 21843839]. 11. Yfantopoulos J. Measuring quality of life and the European health model. Arch Hell Med. 2007;24(supl 1):6-18. 12. Eyigor C, Eyigor S, Kivilcim Korkmaz O. Are intra-articular corticosteroid injections better than conventional TENS in treatment of rotator cuff tendinitis in the short run? A randomized study. Eur J Phys Rehabil Med. 2010;46(3):315-24. [PubMed: 20926997]. 13. Santos CM, Francischi JN, Lima-Paiva P, Sluka KA, Resende MA. Effect of transcutaneous electrical stimulation on nociception and edema induced by peripheral serotonin. Int J Neurosci. 2013;123(7):507-15. doi: 10.3109/00207454.2013.768244. [PubMed: 23336713]. 14. Edwards P, Ebert J, Joss B, Bhabra G, Ackland T, Wang A. Exercise rehabilitation in the non-operative management of rotator cuff tears: A review of the literature. Int J Sports Phys Ther. 2016;11(2):279-301. [PubMed: 27104061]. [PubMed Central: PMC4827371]. 15. Rached RA, Rampim DB, Yamauti RH, Azeka MS, Santos RM, Guidolin B. Rotator cuff syndrome: Rehabilitation. Acta Fisiatr. 2013;20(2):96-105. 16. Galanis P. Number of randomized clinical trials. Appl Med Res Arch Hellenic Med. 2009;26(4):544-57. 17. Fleiss JL. Statistical methods for rates and proportions. 2nd ed. New York: Wiley; 1981. 18. David C. Fundamental statistics for the behavioral sciences. Howell: Duxbury Press; 1985. 19. Mordkoff JT. The assumption(s) of normality. 2016. 20. van der Heijden GJ. Shoulder disorders: A state-of-the-art review. Baillieres Best Pract Res Clin Rheumatol. 1999;13(2):287-309. doi: 10.1053/berh.1999.0021. [PubMed: 10952865]. 21. Lech O, Valenzuela Neto C, Severo A. Conservative treatment of partial and complete tears of the rotator cuff. Acta Ortop Bras. 2000;8(3):144-56. doi: 10.1590/s1413-78522000000300008. 22. Angst F, Schwyzer HK, Aeschlimann A, Simmen BR, Goldhahn J. Measures of adult shoulder function: Disabilities of the arm, shoulder, and hand questionnaire (DASH) and its short version (QuickDASH), shoulder pain and disability index (SPADI), American Shoulder and Elbow Surgeons (ASES) Society standardized shoulder assessment form, constant (Murley) score (CS), simple shoulder test (SST), Oxford shoulder score (OSS), shoulder disability questionnaire (SDQ), and Western ontario shoulder instability index (WOSI). Arthritis Care Res (Hoboken). 2011;63 Suppl 11:S174-88. doi: 10.1002/acr.20630. [PubMed: 22588743]. 23. Steuri R, Sattelmayer M, Elsig S, Kolly C, Tal A, Taeymans J, et al. Effectiveness of conservative interventions including exercise, manual therapy and medical management in adults with shoulder impingement: A systematic review and meta-analysis of RCTs. Br J Sports Med. 2017;51(18):1340-7. doi: 10.1136/bjsports-2016-096515. [PubMed: 28630217]. [PubMed Central: PMC5574390]. 24. Hawk C, Minkalis AL, Khorsan R, Daniels CJ, Homack D, Gliedt JA, et al. Systematic review of nondrug, nonsurgical treatment of shoulder conditions. J Manipulative Physiol Ther. 2017;40(5):293-319. doi: 10.1016/j.jmpt.2017.04.001. [PubMed: 28554433]. 25. DeSantana JM, Walsh DM, Vance C, Rakel BA, Sluka KA. Effectiveness of transcutaneous electrical nerve stimulation for treatment of hyperalgesia and pain. Curr Rheumatol Rep. 2008;10(6):492-9. [PubMed: 19007541]. [PubMed Central: PMC2746624]. 26. Desmeules F, Boudreault J, Roy JS, Dionne CE, Fremont P, MacDermid JC. Efficacy of transcutaneous electrical nerve stimulation for rotator cuff tendinopathy: A systematic review. Physiotherapy. 2016;102(1):41-9. doi: 10.1016/j.physio.2015.06.004. [PubMed: 26619821]. 27. Curtis D, Fallows S, Morris M, McMakin C. The efficacy of frequency specific microcurrent therapy on delayed onset muscle soreness. J Bodyw Mov Ther. 2010;14(3):272-9. doi: 10.1016/j.jbmt.2010.01.009. [PubMed: 20538225]. 28. Kwon DR, Kim J, Kim Y, An S, Kwak J, Lee S, et al. Short-term microcurrent electrical neuromuscular stimulation to improve muscle function in the elderly: A randomized, double-blinded, sham-controlled clinical trial. Medicine (Baltimore). 2017;96(26). e7407. doi: 10.1097/MD.0000000000007407. [PubMed: 28658177]. [PubMed Central: PMC5500099]. 29. Ainsworth R, Lewis JS. Exercise therapy for the conservative management of full thickness tears of the rotator cuff: A systematic review. Br J Sports Med. 2007;41(4):200-10. doi: 10.1136/bjsm.2006.032524. [PubMed: 17264144]. [PubMed Central: PMC2658945]. 30. Pegreffi F, Paladini P, Campi F, Porcellini G. Conservative management of rotator cuff tear. Sports Med Arthrosc Rev. 2011;19(4):348-53. doi: 10.1097/JSA.0b013e3182148dc6. [PubMed: 22089284].